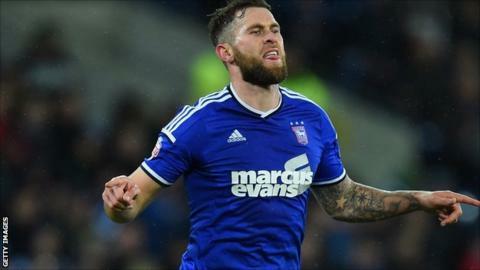 Daryl Murphy's header rescued a point for Ipswich as Bournemouth lost ground on Championship leaders Derby. Yann Kermorgant's scissors kick gave Bournemouth the lead but Ipswich pulled level through Teddy Bishop's side-foot. Ritchie's close-range shot at the back post put Bournemouth back in front, but Murphy equalised with a header from Paul Anderson's free-kick. The result put Bournemouth three points behind Derby, with Ipswich a point further behind in fourth. The Cherries began at a blistering pace with Ritchie thumping the bar from 18 yards before Kermorgant found the net with a superb strike for his fourth of the season. Bournemouth continued to press and Ipswich had goalkeeper Bartosz Bialkowski to thank after he denied Marc Pugh, Callum Wilson and Ritchie in quick succession. Ipswich grew into the game as the half wore on and a header by Murphy glanced the crossbar. Cherries keeper Artur Boruc was also called into action before the break, first saving David McGoldrick's strike with his legs, before tipping Christophe Berra's header over the bar. However, Ipswich equalised five minutes after half-time as Bishop converted Tyrone Mings' cross from 12 yards. That scoreline lasted just four minutes as Bournemouth went back in front, Wilson finding Ritchie, who converted at the back post. Bournemouth were denied a penalty after substitute Tokelo Rantie was sandwiched by two Ipswich defenders, an incident that resulted in the South Africa striker being stretchered off and forced 12 minutes of stoppage time. Pugh's shot was then well saved by Bialkowski, but it was Ipswich who scored next with Murphy's header from Anderson's swung free-kick to make it 2-2. Bournemouth pushed for a winner, with Pugh curling a shot just wide and seeing another effort saved, while Harry Arter blazed over the bar and Brett Pitman wasted another chance in added time. Ipswich boss Mick McCarthy: "I won't have this little old Bournemouth routine because if you come down here with that attitude you will get a slap. They have got a team of real hard-nosed players and they have spent a few bob on getting that. "If you get a point away from home it's a good point. I would take a point without getting off the bus because of how competitive this league is." Bournemouth boss Eddie Howe: "We made a great start. We looked in great form and like we would carry on our good run. "I couldn't be more pleased with the team and I think the only thing that was missing was the goals. I think it was one of our very best performances of the season." Match ends, Bournemouth 2, Ipswich Town 2. Second Half ends, Bournemouth 2, Ipswich Town 2. Corner, Ipswich Town. Conceded by Matt Ritchie. Attempt blocked. Harry Arter (Bournemouth) left footed shot from outside the box is blocked. Assisted by Andrew Surman. Attempt missed. Brett Pitman (Bournemouth) right footed shot from the centre of the box is just a bit too high. Assisted by Matt Ritchie. Offside, Ipswich Town. Daryl Murphy tries a through ball, but Conor Sammon is caught offside. Jonathan Parr (Ipswich Town) wins a free kick in the defensive half. Yann Kermorgant (Bournemouth) wins a free kick in the attacking half. Attempt missed. David McGoldrick (Ipswich Town) right footed shot from outside the box is too high. Assisted by Conor Sammon with a headed pass. Attempt saved. Harry Arter (Bournemouth) right footed shot from the centre of the box is saved in the centre of the goal. Assisted by Brett Pitman with a headed pass. Attempt blocked. Yann Kermorgant (Bournemouth) right footed shot from the centre of the box is blocked. Assisted by Matt Ritchie. Brett Pitman (Bournemouth) wins a free kick in the attacking half. Corner, Bournemouth. Conceded by Jonathan Parr. Attempt missed. Matt Ritchie (Bournemouth) left footed shot from outside the box misses to the left. Assisted by Harry Arter following a set piece situation. Substitution, Ipswich Town. Conor Sammon replaces Teddy Bishop. Attempt blocked. Brett Pitman (Bournemouth) left footed shot from the centre of the box is blocked. Assisted by Harry Arter. Attempt missed. Marc Pugh (Bournemouth) right footed shot from outside the box is close, but misses to the right. Assisted by Andrew Surman. Offside, Ipswich Town. David McGoldrick tries a through ball, but Daryl Murphy is caught offside. Yann Kermorgant (Bournemouth) wins a free kick in the defensive half. Attempt missed. David McGoldrick (Ipswich Town) left footed shot from outside the box is close, but misses the top left corner. Substitution, Ipswich Town. Jonathan Parr replaces Tyrone Mings because of an injury. Attempt missed. Yann Kermorgant (Bournemouth) left footed shot from the centre of the box misses to the left. Attempt blocked. Andrew Surman (Bournemouth) left footed shot from outside the box is blocked. Assisted by Marc Pugh. Delay in match Tyrone Mings (Ipswich Town) because of an injury. Attempt missed. Yann Kermorgant (Bournemouth) right footed shot from outside the box is close, but misses to the right. Assisted by Charlie Daniels. Goal! Bournemouth 2, Ipswich Town 2. Daryl Murphy (Ipswich Town) header from the centre of the box to the top left corner. Assisted by Paul Anderson with a cross following a set piece situation. Tyrone Mings (Ipswich Town) wins a free kick on the left wing.